4Humanities@CSUN proudly announces their new MiniDoc project: “Telling Our Stories: A First-Year Students’ Panel on Literacy Narratives.” This MiniDoc features a session from the 2013 Associate Graduate Students of English conference (AGSE), comprised of four first-year students’ who each share their literacy narrative in a conference-style panel. 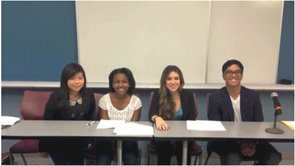 These students, Valerie Mok, Sarah Villagra, Renee Miller and Dennis Villa share the wisdom they’ve gained through their multicultural pasts. The film also features interviews the students’ professors, Prof. Gina Lawrence and Prof. Susana Marcelo, as well as Dr. Irene Clark, CSUN’s Stretch Curriculum Coordinator, to gain insight into the assignment and value of literacy narratives in general. The film begins with Dr. Clark describing how a literacy narrative, in its most “common form,” is a story where “the student begins with a place where he or she is on the outside, uncomfortable, not knowing something, needing to master something.” All of the students’ narratives exemplify this concept, each beginning in a place outside of his or her native culture, then ultimately reconciling both cultures into an identity with which he or she is more comfortable and is beneficial to his or her life and goals. Prof. Gina Lawrence discusses the original literacy narrative assignment she presented to her students, which stemmed from David Sedaris’ collection of essays, “Me Talk Pretty One Day,” and Amy Tan’s novel, “Mother Tongue.” Her student Valerie, who has only been in the United States for about three years, gives a Chinese Proverb that her mom offered her before coming to America that describes, in her words, “how an object or product [as] it leaves its home town, immediately becomes a lot more valuable,” much like “imported goods.” She found this saying to be “slightly true,” and then goes on to explain how the British vocabulary she attained at a private Catholic high school in China led to a few misinterpretations at her American university. She follows up this story with an original song about her experiences, impressively played and sung on her ukulele. Lastly, Prof. Marcelo introduces Renee, a student who initially “never really connected to reading and writing” and considered them part of “her lowest skill [set].” Unlike the other students, Renee was born and grew up in the US; however, in elementary school, she was an “outcast”—her private elementary school, was “made up of 85% Caucasian [students], and 3% African American,” thus causing her to “hate going to school.” She now feels “the sky’s the limit,” and, after recognizing the benefits of learning English, she now feels the world “has opened up to her.” She feels she “has gained so much from the subject she despised,” as “words not only changed [her] life, but shaped the way [she] is now.” She now recognizes the power of words, as they consoled her during the grieving of her father’s death and encouraged her to do well on a test. The most important words, she recalls, came from her grandmother who told her “to remember who you [she] is.” Those words, she says, she’ll never forget. Dr.Irene Clark, Professor of English, Director of Composition, and Director of the Master’s option in Rhetoric and Composition at California State University, Northridge, has researched and published on a wide-range of writing-oriented topics, including composition theory and practice, different approaches to the writing center, genre theory, and learning transfer. Her most recent book is the second edition of Concepts in Composition: Theory and Practice in the Teaching of Writing, published by Routledge/ Taylor and Francis. She is currently working on a book that focuses on genre theory and transferability. Prof. Gina Lawrence is now a first year PhD student at the University of Texas at El Paso, but she received her B.A. in English Subject Matter and her M.A. in Rhetoric and Composition from California State University, Northridge, where she also worked as a Supplemental Instructor and Teaching Associate. She has spent the last year studying new media, in particular, blogging, as a tool in the writing classroom to facilitate both audience awareness and regular, focused writing. Her current research interests include feminist rhetorics, food studies, and new media. While her CSUN peers greatly miss her, Lawrence’s hope is that UTEP will offer her a space to pursue these interests as well as explore new ideas in the rapidly expanding and exciting field of composition studies. Prof. Susana Marcelo is pursuing a master’s degree in English with an emphasis in creative writing at California State University, Northridge where she is also a second-year teaching associate. Her background includes being an editor and writer for six years working with newspapers, content strategists, and an eclectic list of companies focused on print and online publishing.